Find out what happens in Act 1 in a performance of "The Nutcracker" ballet. Act 2 in a performance of "The Nutcracker" ballet. Watch a video trailer of a performance of "The Nutcracker" ballet. Colour in a picture of a nutcracker online. Print out and shade in a picture of the Sugar Plum Fairy and other characters, finger puppets and puzzles from "The Nutcracker". 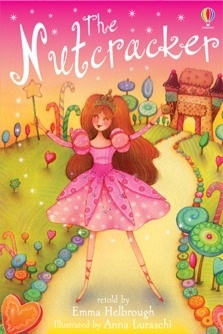 Print out a Nutcracker booklet with scenes from the ballet to colour. Enchanting retelling of the classic story with easy reading text for children beginning to read alone. Clara's adventure begins on Christmas Eve with an amazing present - a magic doll. Soon she is flying in a sleigh to the Land of Sweets where she meets the Sugarplum Fairy. The Usborne Reading Programme has been developed in conjunction with reading experts from Roehampton University.